AVORA's channel centers around the power of machine learning and augmented intelligence in analytics. AVORA is a next-generation data intelligence solution with embedded AI and machine learning. AVORA consolidate data from hundreds of sources and deliver accelerated time to insight for all business users. AVORA’s embedded machine learning automatically detects anomalies and trends across the entire data set, alerting stakeholders to key changes in business performance in real-time. The platform also identifies the root cause of any anomalies, allowing users to react immediately to any issue, taking proactive action to benefit the business. Alvin Chan, Head of Product & Data Science, and Paul Way, VP Sales. 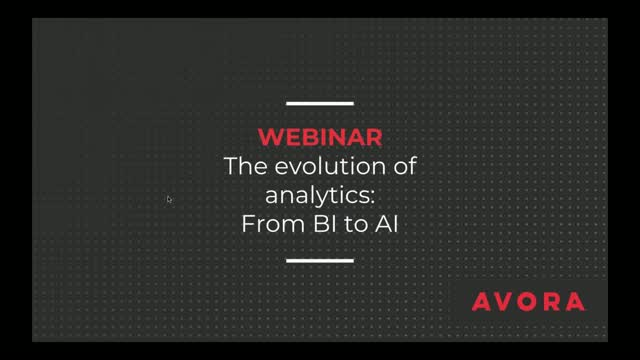 The session will discuss how analytics have evolved, from traditional BI and data warehousing to big data and data visualisation and now to next generation augmented analytics.